Enjoy Arda Beach on a sunny day, while you’re visiting Viana do Castelo, Portugal. 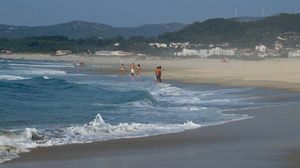 Praia da Arda Beach features an extensive sandy beach protected by a chain of dunes. This beach in Viana do Castelo is very popular among the surfing and bodyboarding sportpeople. Praia da Arda, Viana do Castelo. Blue flag, services, showers, restaurants, lifeguards, access for people with reduced mobility, parking, etc.